WHAT GIVES YOU THE RIGHT? Singer/songwriter/student Adam Schneider just released a full-length album inspired by the Civil Rights movement. Singer songwriter Adam Schneider’s project Turning Away is a compelling and powerful set of 10 songs laden with meaning and soul. Adam’s rich music is complimented by apple-butter-on-warm-toast smooth vocals. One of the most striking elements of this album is Adam’s dedication to justice, love, and equality. Each song boasts a powerful message that has been skillfully crafted to settle comfortably into your cranium to be digested and thought of long after the album has finished. Adam, a UW-Eau Claire student, has written and played music for most of his life. However, he says that music should be built around the community that it reaches and the real power of music is to bring to light the struggles and issues that we face as a society. This realization came while on the annual Civil Rights Pilgrimage sponsored and organized by UWEC. “Up until this point,” he says, “I knew what was going on in civil rights, but I had turned away, ignoring the issues that people faced every day.” Each song is themed around a different issue that needs to be addressed, things that we need to stop turning away from. Adam ambitiously passes through the whole gauntlet of issues, from bullying to the tragic death of Trayvon Martin to the unrealistic and dangerous views of beauty as a result of Photoshopped models. The lyrics, while rich in detail and strong in content, also flow in well-crafted poetry and will, as all good poetry does, cause the listener to pause and ponder and dissect the meanings. Adam’s penchant for music found a perfect paring in Evan Middlesworth, owner of Pine Hollow Audio recording studio, and drummer Zach Brawford. The three worked very well together, and Adam had nothing but praise for the duo who helped bring the album alive. This was Adam’s first collaborative project beyond the realm of school-based music, and the sound is remarkably mature. The project also brought Sue Orfield in on saxophone, Billy Angel on Hammond organ, Todd Barneson on mandolin, and Chris Jorgenson for some sweet backup vocals. The collaborative work for this album speaks to another point of import for Adam in the work he has presented: the need for community to make the changes necessary for a better world. Even the layout and the imagery of the album case provide insight into the importance of this issue. If you want an album to speak to you, either through lyrics or music, you will discover Turning Away to be the whole package. 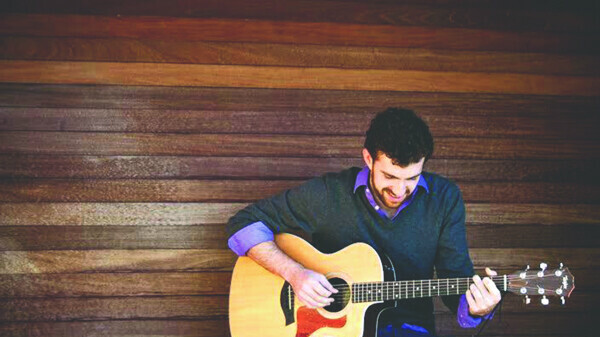 To learn more about Adam Schneider and his album visit www.facebook.com/adamschneidermusic. To by the album, go to www.cdbaby.com/cd/adamschneider. If you want to discover, as Adam Schneider did, what it means to stand for the rights of anyone and everyone, UWEC’s Civil Rights Pilgrimage is a good way to start. The 10-day journey – held in January and again in March – takes UWEC students across the South to visit sites important to the Civil Rights movement, including the birthplace of Martin Luther King Jr. in Atlanta; the Birmingham Civil Rights Institute in Birmingham, Ala.; the Civil Rights Memorial and the Rosa Parks Museum and Library in Montgomery, Ala.; and much more. Visit www.uwec.edu/dos/programs/crp/ for details.